The blasts, which injured scores of passengers, drivers, hawkers and visitors, also destroyed five Marco polo luxury buses. A Marco polo bus belonging to Gobison Motors had on board over 70 passengers when it was attacked by the suicide bombers as it was about departing the ever-busy park for Lagos. One of the security sources, who did not give his name because he was not permitted to do so, told our correspondent that the death toll was high because the luxury buses were parked close to one another since they were to move in convoy. “The luxury buses always travel in convoy for security reasons and this was why the casualty figure was high. They were parked close to one another. Most passengers in the first bus which might have had at least 70 passengers, including those that were given seats called ‘attachment’, died,” he said. The officer explained that each of the buses had about 75 or more passengers. 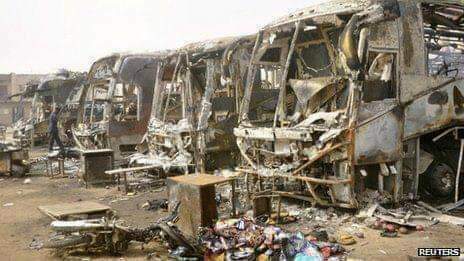 “One of the suicide bombers must have timed the attack because he drove into the park and attacked the first bus when the five buses were filled up and were about to drive out in convoy to Lagos and that was why he (bomber) achieved a heavy casualty rate,” he said. The Commissioner of Police, Alhaji Musa Daura, told journalists in Kano that the attack was executed by two suicide bombers, who rammed their vehicle against one of the luxury buses. He said this caused the bus to burst into flames which affected passengers, hawkers, traders and workers at the park.